I’m sitting just inside the lobby of Las Vegas’ Paris Hotel to escape the sweltering heat that seems to radiate from the sidewalks and buildings as well as the sun. I would like to cover my ears to block out the sounds of slot machines, sirens, traffic, and raised voices. I feel as if I’ve just arrived from the moon. A glance at my photographer’s face tells me she’s also in sensory overload – with a highly unusual lack of desire to capture anything on film. Nine days earlier we were in the Las Vegas Airport, awaiting our charter flight to Page, Arizona, and the start of an eight-day rafting trip through the Grand Canyon. We met the Bresnicks of Los Angeles there–Scott and his daughters Jocelyn, 15, and Nicole, 14. 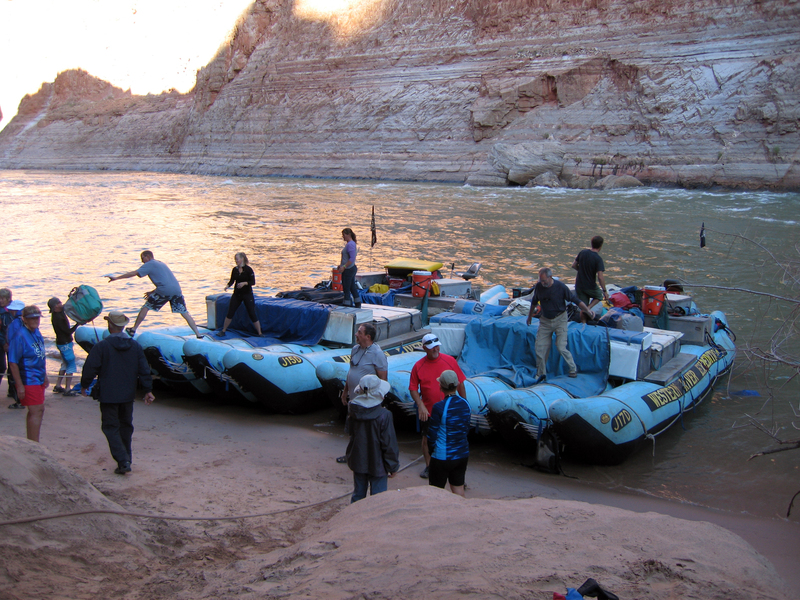 “Are you looking forward to a week on the Colorado River?” I asked the two teenagers. Scott, the father/villain in question, shrugged and grinned at me. I figured he would have a lot more gray hair before this was over. Perhaps we all would. At the river put-in we met the 26 other rafters and four guides with whom we would share the 188-mile journey from Lees Ferry to Whitmore Wash. Our vessels: two 15- by 37-foot rafts with 25-horsepower motors. Mounded in the center of the rafts and secured with heavy netting were dry bags with our clothes, sleeping bags and tents. Before the day was out, a 20-foot-high wall of water in House Rapid (ranked a 9 on a scale of 1 to 10, 10 being the most difficult) had swept away Scott’s prescription bifocal glasses, leaving him with no visual backup. Jocelyn screamed and Nicole cried through the rapids, but I caught a hint of a smile more than once. We began calling them “the princesses,” which they took with good humor. Before the day was out, spunky Red Barber, 81 ½ years old, the senior member of our new tribe, had endeared himself to everyone. His daughter, Sherisue, had arranged the trip, which would become the ultimate father /daughter bonding experience. Before the first day was out, our guides had regaled us with river stories and poetry, and spoiled us with meals worthy of a fine resort, with fresh fruit and salads, and great meat dishes. Our menu for the trip would range from Mexican to rainbow trout and steaks. As that day faded into rosy twilight, everyone realized we were in for a special experience. The days that followed were filled with sun-splashed hours spent drifting along on the river, exploring side canyons and ancient Anasazi sites, watching bighorn sheep and other canyon critters, and cavorting under waterfalls warmed by the sun. Each afternoon we set up camp among the cottonwoods on sandy beaches that sometimes bore faint footprints of the previous occupants, but nothing else. No litter. No burned-out campfires. No damaged rocks or vegetation. More than 20,000 people raft the Colorado each year, but the only other humans we saw were a handful of private rafters. Commercial trips are carefully staggered and the number of private boaters is so limited that the wait for a river permit is often a year or more. Whether private or commercial, visitors are required to carry out all refuse, including human waste. The river lulled us to sleep at night, and we awoke to its murmur each morning. Over breakfast we watched the sun strike the cliffs far above us and creep down the canyon walls. Sometimes it took awhile to reach us, because the river is as much as a mile below the rim and the canyon floor varies in width from a half-mile to 18 miles. Two billion years of geologic change are exposed on the canyon walls, more information on the earth’s history than anyplace else in the world. Nature used all of the colors on her palette here, and the river has sculpted stones into fantastic shapes worthy of scenes from Lord of the Rings. In many places house-sized boulders totter on tiny spindles of porous rock, awaiting their turn to tumble into the river. The water ranges from 30 to 60 feet deep, and it is the . 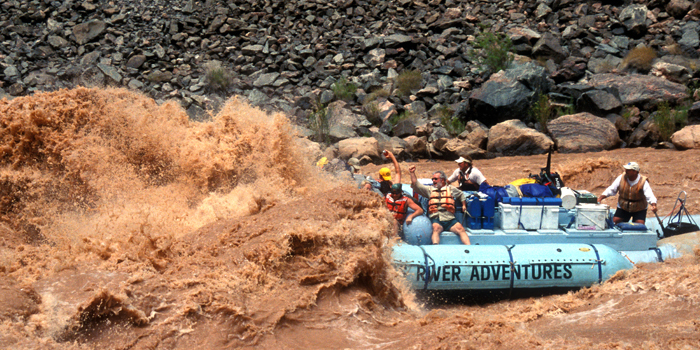 second (cfs)–compared to 4,000-5,000 cfs on some of the East’s scariest whitewater rivers. Every rapid has a name steeped in legend. Before each one, our guides would idle the rafts in an eddy while they explained the history and character of our next whitewater encounter. All the while, we could hear the ominous rumble ahead, and sometimes see mist rising from the cauldron that awaited us. Then it was time to hang on and scream as the raft rolled and bucked its way through, sometimes with the front two-thirds of the raft momentarily submerged. We navigated more than 60 rapids rated 5 or higher, and a half-dozen 9’s and 10’s, including the famous and terrifying Lava Falls, which rages through the canyon at 27 mph. Listed in the Guinness Book of World Records as the fastest navigable rapid in the world, Lava Falls makes the most daunting roller coaster feel like a kiddie ride. In the Bar 10 gift shop Red Barber’s daughter uncharacteristically bought a toe ring with tiny footprints on it. “It’s to remind me to try the path less traveled more often,” she explained. I bought one, too, to remind me of the day that a storm caught us on the river. Bolts of lightning veined the dark clouds above the canyon rim and thunder reverberated off the canyon walls like giants beating on a drum. The river responded with a roar as it swept us toward our next rapid through sheets of warm rain. Inside my head, the Grand Canyon Suite was playing. (Could the composer Grofe have been a river rat?) I lifted my face to the rain and reveled in the most awesome display of Nature I had ever witnessed. For more information on river raft trips, visit www.westernriver.com or www.riveradventures.com. Footnote: One of the seven natural wonders of the world, the Grand Canyon was inhabited by nomadic hunters more than 11,000 years ago. It was “discovered” by the Spanish in 1540 and passed from Mexican control to the U.S. in 1848. A decade later, John Wesley Powell, a professor of geology who had lost one arm in the Civil War, became the first white man to explore the Colorado’s route through the Canyon.